Last year, I wrote a post verifying Xiaomi's claim that their users are twice as active as those of other manufacturers, which also validated their long-term pursuit of a services-oriented business model. But as they moved to lower price points, we assumed that their engagement levels would gradually decline. However, based on some recent metrics revealed by the company, that may not be the case. According to Xiaomi, cumulative downloads on the MIUI app store hit 10 billion in November 2014, with 50 million downloads seen every day. 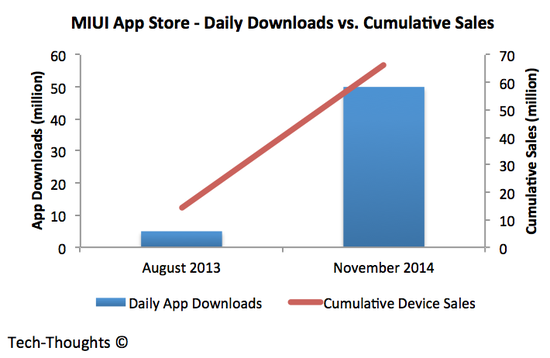 This compares to 1 billion cumulative downloads and 5 million daily downloads in August 2013. The scale of this growth is certainly staggering, but is this purely a result of an explosion in sales (and active users)? In my post about Xiaomi's engagement metrics, I calculated that each active MIUI user downloaded an average of 26.5 apps per device, compared to just 13-15 for iOS and Google Play users. This was when Xiaomi had just 17 million active users. This figure has swelled to 70 million according to the company's founder. 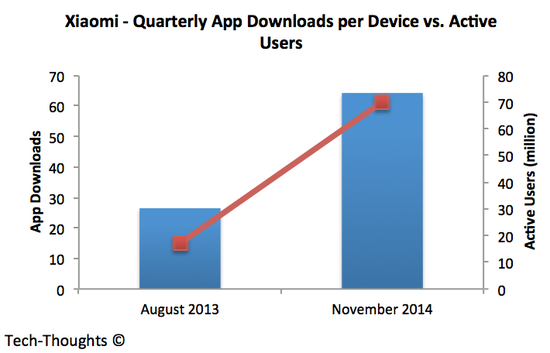 Based on this figure, Xiaomi's download rate per device has more than doubled over the past year. Somehow, Xiaomi has managed to hit much lower price points, more than quadruple their user base and still double user engagement.